It's almost always a struggle for the bride and groom to select gifts for their bridal party. Today, I wanted to talk about gifts for the groomsmen. When grooms don't know what to give their groomsmen, the first instinct is to give a flask of some sort. 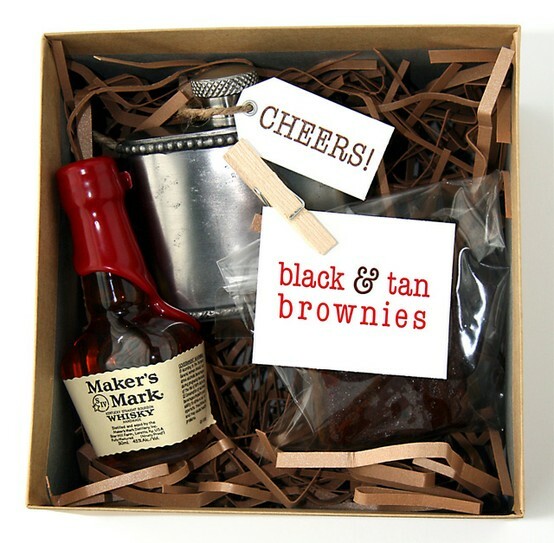 Because I love custom gifts, am a little partial to gift baskets, and feel men are simply overlooked when it comes to gift baskets, I felt the need to show an idea that I so happened to stumble upon. We all know the old adage, the way to a man's heart is through his stomach. Why not say "thank you" by adding a little homemade goodie to go along with that flask? This DIY project can even be accompanied with a whiskey for the flask and the homemade treat can even be coordinated to match your wedding colors. Sometimes, you just have to get a little creative when it comes to saying "thank you". Besides, your thoughts and actions are often much more appreciated than your money. Looking to make the brownies, below is the recipe. Place one rack in lower third of oven; place another rack in center of oven. Preheat oven to 350°. Butter a 13 x 9-inch baking pan (making sure to butter the sides), line with parchment, and butter the parchment; set aside. To prepare Tan Brownies, place 6 tablespoons butter and brown sugar in a medium bowl; beat with a mixer at medium speed until light and fluffy. Beat in 2 eggs and 1 teaspoon vanilla. In a small bowl, combine flour, baking powder, and 1/4 teaspoon salt, stirring well. Add flour mixture to sugar mixture, beating just until combined. Spoon into the prepared pan coated with cooking spray, spreading evenly with a knife or rubber spatula; try to get as even a surface as possible. Bake at 350° in lower third of oven for 15 minutes. To prepare Black Brownies, melt chocolate and 4 tablespoons butter in a large microwave-safe bowl on HIGH for 1 minute or until melted, stirring after every 20 seconds until smooth. Add granulated sugar, stirring until well combined. Add 2 eggs, 1 teaspoon vanilla, and Guinness, stirring with a whisk until well combined. In a small bowl, combine flour and 1/4 teaspoon salt, stirring well. Add flour mixture to chocolate mixture, stirring to combine. 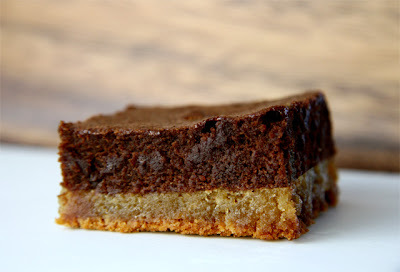 Pour mixture evenly over Tan Brownies; avoid mixing into the tan layer. Bake on the center rack at 350° for 25 minutes or until a wooden pick inserted into center comes out almost clean. Cool in pan on a wire rack; cut into squares.